Moneypenny Chair From Boss Design Office Chairs. 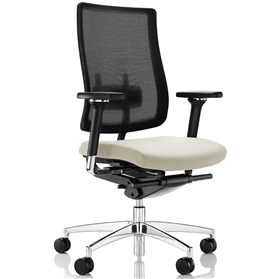 Incorporating a stylish breathable mesh-back and using the highest quality components, Moneypenny is a versatile task chair with a superior level of comfort. Ergonomically engineered, it has a range of adjustment controls for individual needs and an easily manoeuvred pad for optimum support in the lumbar zone. An optional headrest is available.